Tony Izzo, shown here with his crew, won the 17th annual Bettenhausen Memorial. Schererville, Ind. 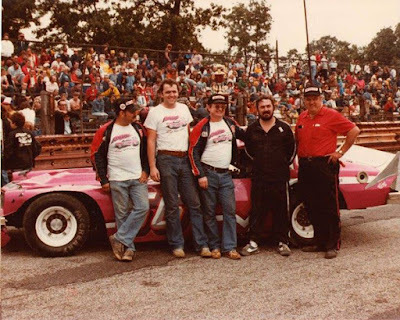 (September 17, 1978) – A master of dirt track late model competition, Tony Izzo made his mark on the pavement side of stock car racing Sunday afternoon, as he captured the 17th annual Tony Bettenhausen 100 at Illiana Motor Speedway. The 34-year-old speedster, who won the 1977 and ’78 track championships at Santa Fe Speedway in Willow Springs, Ill., wheeled his Camaro to victory, the first major asphalt win for the Bridgeview, Ill., pilot. 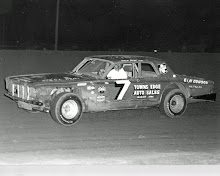 Due to threatening weather conditions, promoter Harry Molenaar decided to start all qualified cars in the 100-lapper, thus upping the starting field to 39 from the originally slated 30. At the drop of the green flag, Izzo put his racer into the lead from his outside front row starting position. He built and maintained a commanding margin through lap 10 when the first yellow flag waved. When the green flag waved again, Izzo stayed on top with four-time Illiana champ Ed Hoffman and 1976 and ’77 Bettenhausen winner Ray Young closing in quickly. Lap 17 saw Hoffman, who captured the 1975 Bettenhausen event, moved his Camaro into the lead, followed by Izzo and Young. Young charged past Izzo on lap 31, with the intent of keeping the leader in his sights. Rolling along and picking up lap prize money in the process, Hoffman led the contest through lap 51. Then developing clutch problems forced Hoffman to relinquish the top spot to Young on lap 52, with Izzo moving past Hoffman on the same circuit. 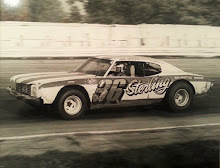 The stocky Young guided his Camaro around the half-mile oval looking stronger lap after lap, in his effort to become to the first driver to win three Bettenhausen Classics in a row. As the race neared the three-quarter mark, the racing surface became oily and slippery, and drivers began having their hands full just keeping their mounts pointed in the right direction. The worsening track conditions seemed to be a blessing for Izzo, as his small-block Chevy began working better than any of the remaining entries. Izzo quickly closed in on Young, pressing the leader for the number one spot. On the 89th lap, Izzo moved to the inside of Young and took command as the duo charged thru turns one and two. Jerry Kemperman, running well all day, followed Izzo past Young, and became the next serious challenger. But Izzo began to pull away as the race drew to a climax, with Young and Hoffman coming back to take second and third, respectively. 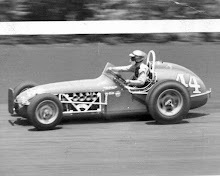 At starter Bob Adams’ checkered flag, Izzo held a comfortable margin over Young, Hoffman, Kemperman, and Dave Weltmeyer. 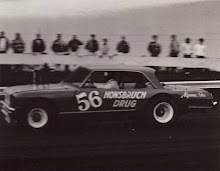 Bobby Dotter, driving a Camaro, paced the 45 cars in time trials, with a lap of 21.038 seconds, but a blown engine sent the youngster to the sidelines in the early going of the main event. 1. Tony Izzo, Bridgeview, Ill.
2. Ray Young, Dolton, Ill.
3. Ed Hoffman, Niles, Ill.
4. Jerry Kemperman, Blue Island, Ill.
5. Dave Weltmeyer, Harvey, Ill.
7. Gene Eding, Grand Rapids, Mich.
8. 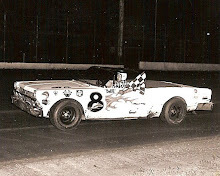 Frank Gawlinski, Calumet City, Ill.
9. Bruce Odell, Palos Heights, Ill.
10. Woody Church, Chicago Ridge, Ill.
11. Gil Tarbutton, Lake Eliza, Ill.
12. Larry Middleton, East Hazel Crest, Ill.
13. Bob Strait, Flossmoor, Ill.
14. Stash Kullman, Calumet City, Ill.
15. Billy Kuhn, Blue Island, Ill.
16. Tom Nielsen, Oak Lawn, Ill.
17. Ron Dole, Oak Forest, Ill.
18. Pat Echlin, Calumet Park, Ill.
19. Butch Ledy, Matteson, Ill.
20. Paul Mollick, Merrillville, Ill.